The Beatles press conference and gold record presentation by Capitol Records President, Alan Livingston, was recorded on the afternoon of August 29, 1965, at Capitol Records Hollywood headquarters. 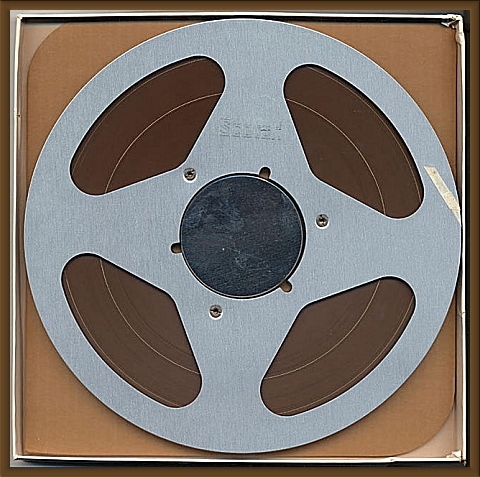 This is the actual 1/4" open reel, 15 ips speed mono recording master tape for an unissued LP documenting an edited 26-minute version of that event. Please note it has "PRO" numbers assigned (PRO 2943-2944)...designating it was to pressed as an LP for promotional purposes only with 2 sides. No copies of this album have ever surfaced...not even in acetate form. Subjects covered include the previous concert in San Diego, that evening's Hollywood Bowl appearance, Lennon's next literary endeavor, the next movie, rumours of a break-up, church attendance, disposition of fan mail, relaxation time, Russian relations, Mexico, movie and teen magazines, corrupting America's youth, fan mail, MBE's, the Byrds, rehearsing, gold record presentation for Help! The Beatles are easygoing, sometimes sarcastic, clever, and witty. Perhaps, the funniest moment comes at the very end when Alan Livingston hands each Beatle his own gold LP for Help!....John jokingly says "I'm glad you've got four. I'm fed up with fighting for one!" A written transcript may be accessed online at The Beatles Ultimate Database, including several exchanges edited from the proposed album. This reel was found in the trash in the early 1970's when Capitol closed it's New York studio. The tape is mounted on a large metal reel and stored in a Scotch storage box with a Capitol label on the top. No reproduction rights are given or implied. This reel is being offered as a collector's item only!